← Bursley Nominated as a Blue Ribbon School! It’s Not Your Mom’s Anatomy + Physiology Class! Melanie Zuber [far left] assists students with a dissection. 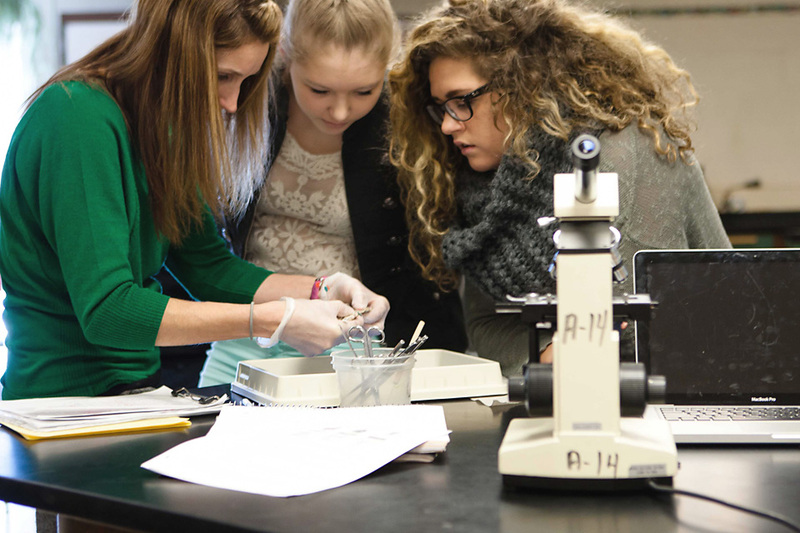 Once upon a time we dissected frogs and worms to learn about anatomy and the systems that make us work but these days, the students at Jenison High School are digging a little deeper. Cow eyes, lamb brains, sheep kidneys and pig hearts are all on the menu…in a manner of speaking. A dissected pig heart gets identified by a student. 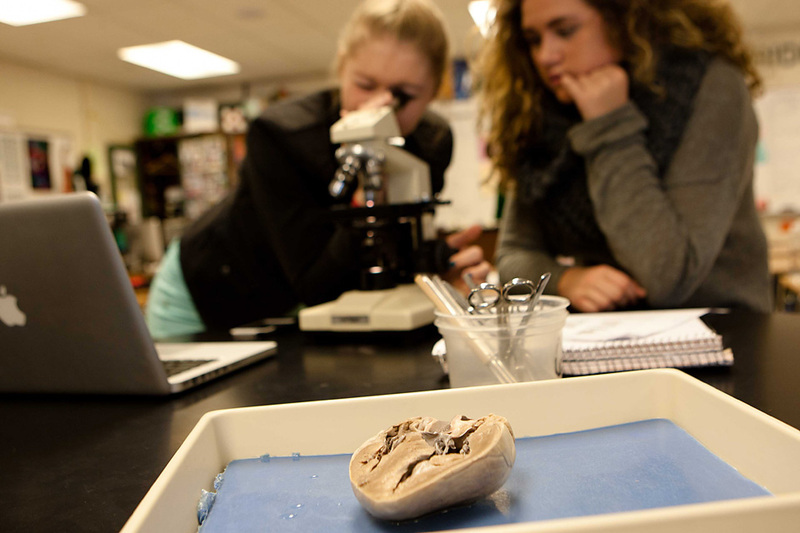 Students in grades 10 – 12 who have completed Biology are eligible to take this college-prep class. 9th grade students who have done especially well in Biology are encouraged to take Anatomy + Physiology in their sophomore year as a pre cursor for AP Biology junior or senior year. 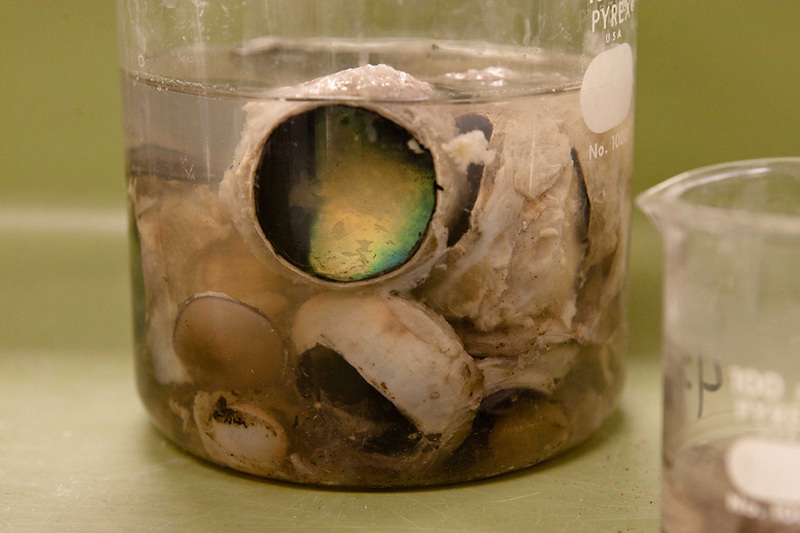 Students use colored pins to identify the various parts of this cow’s eye. One highlight of the class is, of course, the hands-on experience that comes with dissections. 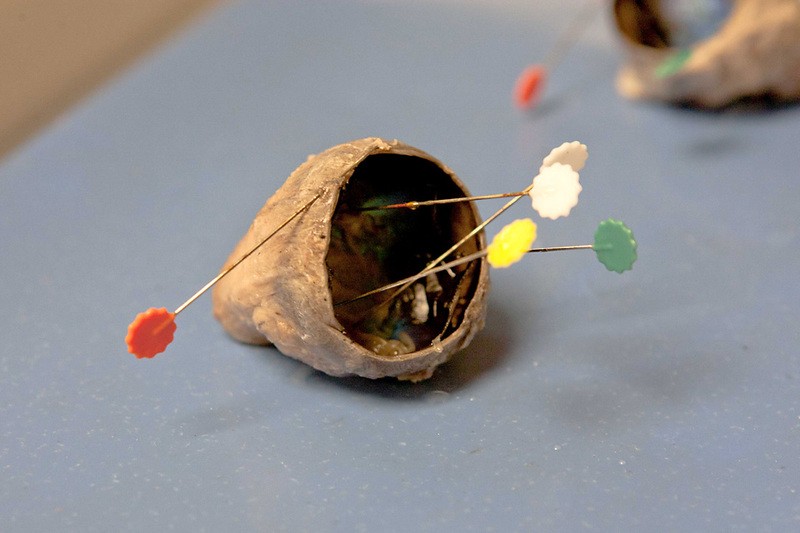 “Since this class is an elective, students who have chosen to take the course know it is a requirement and already have an interest in doing the dissections. Students are often amazed at how different the dissections are from virtual examples and practice images/diagrams that they look at before dissecting. I enjoy the level of student questions and engagement that comes from doing the dissections. We dissect a pig heart, cow’s eye, sheep brain, sheep kidney, we also dissect the cat doing an extensive study of the muscles form and function. At the end of the year we continue to use the cat to dissect the internal chest and abdominal cavity to observe the complexity of the organs and systems working together. Science and education are obvious passions for Ms Zuber who has been an educator for 15 years and in Jenison for the past seven years. Beginning in High School when she volunteered at Hudsonville Nursing Home and what would eventually become Helen DeVos Children’s Hospital, she knew that “working with kids, science and health was a must!” She majored in biology at University of Michigan and, with an emphasis on premed, planned to go to medical school until an educational psychology class derailed her original plan. However, she wasn’t always encouraged to pursue this route. “It became apparent to me that education was where I was headed, but I was constantly being persuaded by others to be something other than “just a teacher.” Well, being the individual that I am, I knew in my heart that educating was not “just a job”, but instead is among one of the most important professions, and a profession where I could have a little bit of everything that I wanted.” Ms. Zuber’s husband, Philip, also teaches in the JHS science department and after some time working in the GVSU labs she jumped at the chance to join him here. 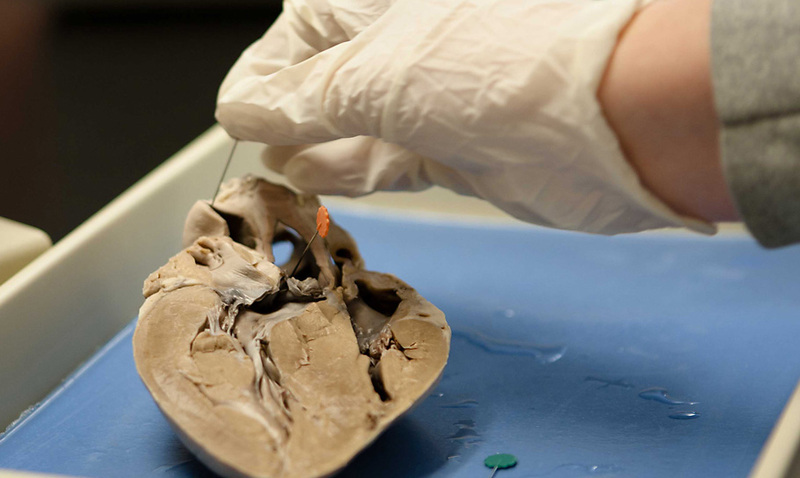 While dissection may not be for everyone, it’s easy to see why students love this class and are being exceptionally prepared for their futures — wherever they may find themselves! A sheep’s brain waits its turn for identification and examination. 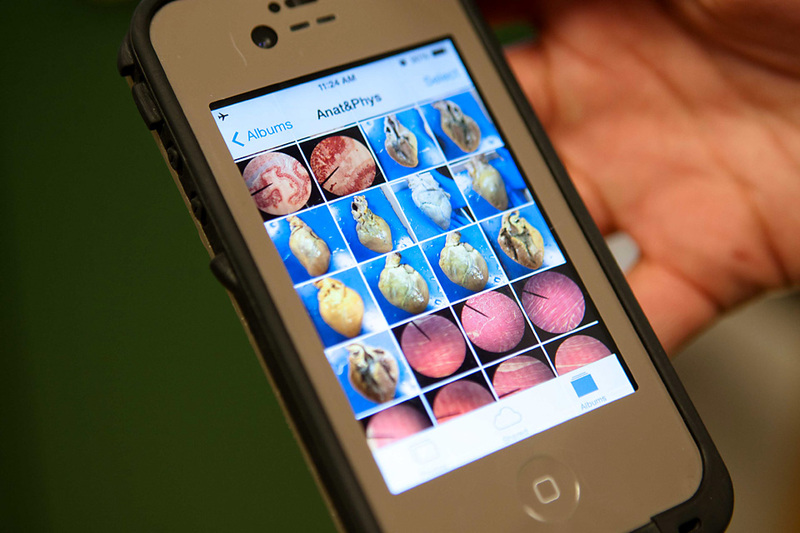 Students are encouraged to use their own cell phones in class to take pictures of specimens for later study.